Mysterious, scorching, foreboding, spiritual, empty—these are all words that I had heard used to describe the Red Centre of Australia. I wanted to experience it and decide for myself. I found that there is so much more to this remote part of Australia than I imagined. 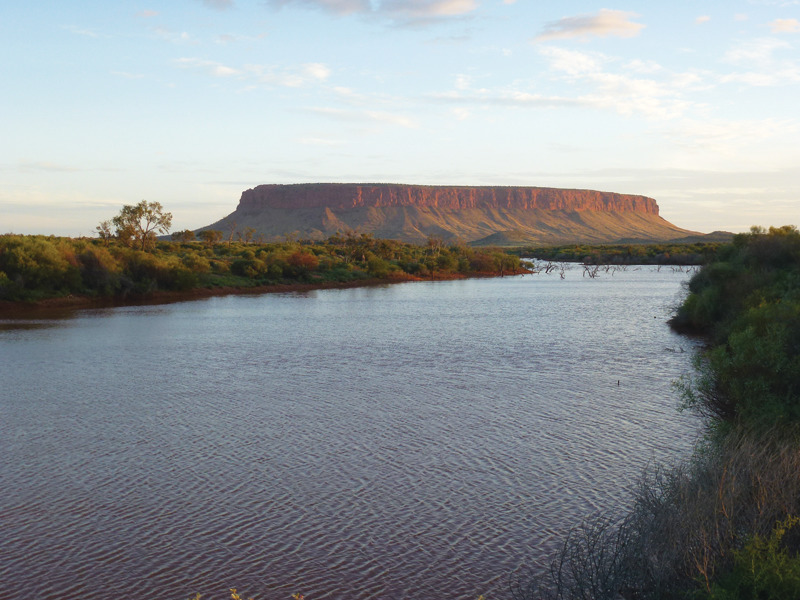 The features that people go to see in the Red Centre are spread over an area roughly 500 kilometres east to west and 250 kilometres north to south. 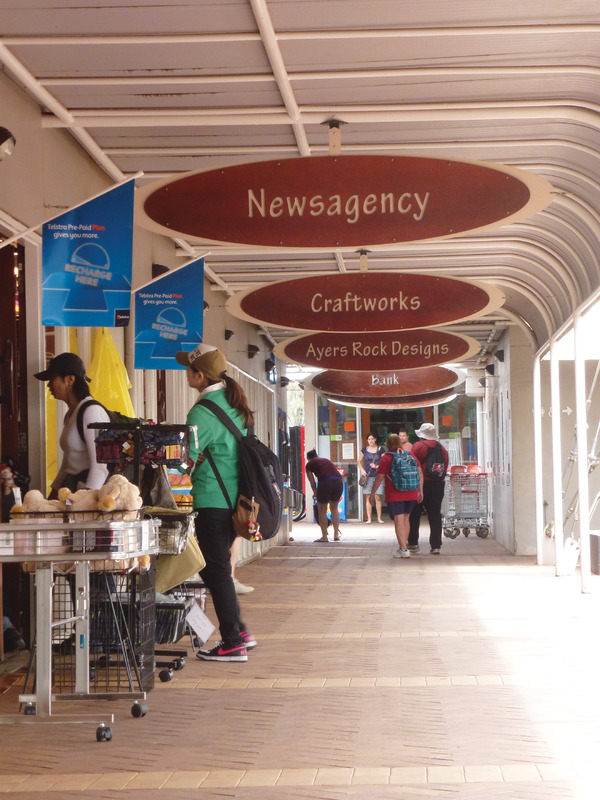 The area is served by the towns of Alice Springs in the northeast and Yulara in the southwest. Each has an airport and there is a paved road of about 450 kilometres, a four and a half hour drive, between them. Alice Springs is also on the Adelaide to Darwin railway that provides regular train service that varies by season. Given this vast area and the mixture of paved and unpaved roads that provide access to the various sites, it is important to have a plan of what you want to see and how long you intend to be there. There are plenty of guidebooks and travel brochures that will help you with this. The other choice to make is what level of comfort you want. The businesses in the area cater to every style, from four-star hotels and deluxe transportation to camping and trekking. There are also various options depending on your level of fitness; there are activities for everyone. Most people will fly to Alice, as it is known locally, or to Yulara, and join a guided tour of between three and eight days. You can also rent a vehicle and plan your own trip, but the logistics of going off-road in the outback are not unlike planning an African safari. Food, water and accommodation are not plentiful and conditions can be severe. I’m not the kind of person who would normally go on an organized tour, but the enthusiastic young lady at the Flight Centre in Bondi Beach where I booked my trip was adamant that it would be much easier, cheaper, and, she emphasized, safer, to join guided tours. I reluctantly agreed, with the condition that the groups be no more than eight people. That turned out to be a good choice. She packed a lot of activity into my seven-day itinerary—much more than I could have done on my own. I flew from Sydney to Yulara, where I spent two days with different tours before joining a three-day overland trip that ended in Alice Springs. I rented a car and had a day of self-guided sightseeing around Alice before taking the overnight train to Adelaide and flying back to Sydney. This trip was a good fit for me. 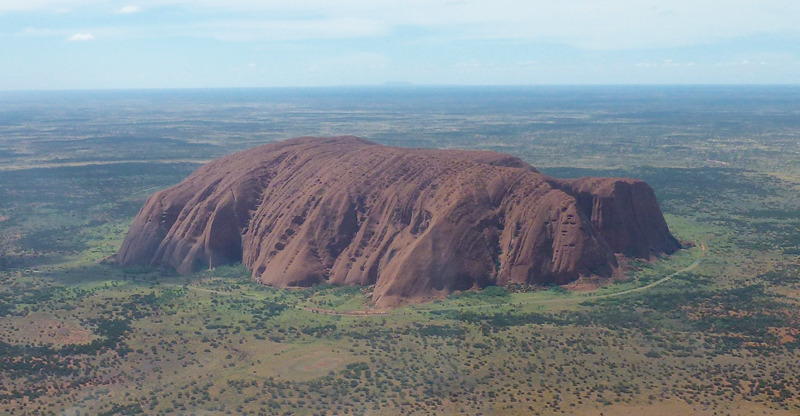 I stayed in a reasonable hotel for the first two nights, and had a chance to see the area around Ayers Rock—or Uluru, as it is known by the local Aborigines—by helicopter, camel and by starlight. Each experience had a special appeal. The view from the helicopter revealed the gravel ridges that mark the landscape, left by the ancient inland ocean, where archaeologists are making new finds. From the helicopter it was also possible to see the strange circular formations formed by the spinifex grasses that were not visible from the ground. Most striking, though, was a new perspective of Uluru as we flew around it (not over it, out of respect for the Aborigines). Popularly photographed from the side at sunset, from elevation it was possible to see the linear form of the erosion of the soft sandstone and the round pock-marks created by flowing water that follows these lines. The camel ride to see Uluru provided as much information about camels as it did the countryside. Camels were first introduced to Australia in the 1840s to help explore the inhospitable interior of the country. Where horses, mules and even bicycles were tried and failed, the camels excelled. They were first used to haul supplies to some of the most remote settlements, being able to carry up to half their own weight and travel for eighteen days without water. When a route for the telegraph line through the middle of the country from Adelaide in the south to Darwin in the north was finally discovered, camels were used to haul the sleepers and other material necessary to push a railway line up to Alice Springs. The success of this endeavour was due in large part to the cameleers that drove and looked after the animals. Collectively known as Afghans, the cameleers were from North Africa, the Arab countries and the area now known as Pakistan. When the railway line to Alice Springs was completed, they were honored by the naming of the train “The Ghan” after them. Camels ready for work at Yulara. Camels continue to be a significant part of life in Australia. While no longer used as draft animals, the descendants of the original camels now run wild and number over one million. They compete with livestock for grazing land and are culled by as many as 10,000 per year in some areas. Some are used for their meat and others are captured and exported to the Arab and Asian countries where they are highly prized as breeding stock. Still others, like my mount, Oprah, are kept for tourism. Some camels have contributed to the success in the film industry as well. The voice of the Chewbacca character in the Star Wars movies was actually recordings of camel sounds. I did join one large group for the “Sounds of Silence” dinner that is held in the outback in sight of Uluru. If the weather is good it is worth the rather expensive admission, if only for the incredible view of the changing colours of the rock as the sun sets and the spectacular sight of the stars in the complete darkness. The buffet dinner, the music of the didgeridoo, and the description of the stars by a local astronomer all add to the experience. On one afternoon I joined a tour, run by SEIT Outback Australia, to Mount Conner. This turned out to be a great trip, made better by knowing that this company has exclusive access through the one-million-acre Curtin Springs cattle station that dominates this area, so we wouldn’t be running into other tour groups along the way. We drove eighty-five kilometres on good paved road, east of Yulara, to get near flat-topped Mount Conner. It is only four metres lower than better-known Uluru, but unlike its famous cousin, the top of Mount Conner is forested. Once we were onto the cattle station, we left the surfaced road and drove across the red, dusty soil through huge tracts of bush and trees and spinifex grass where we saw emus, hawks and songbirds. 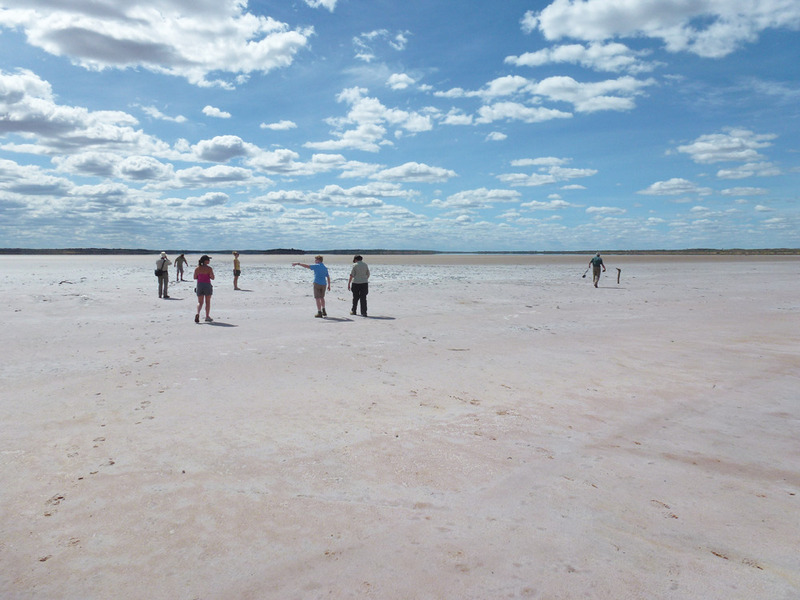 The diversity of the environment on the station includes Lake Swanson, a salt lake about five kilometres across. We drove to its edge and walked out onto the salt crust. It had a pinky hue, created, we were told, by the beta-carotene resulting from bacterial activity in the salty water. Further on we saw a reservoir that was formed to water the cattle. It also attracts resident wildlife, and as the sun began to set we saw a dingo and waterfowl as well as some of the Australian-bred Murray-Grey cattle, preferred among the three breeds of cattle in Australia. As the sun burned the horizon, the bluffs of Mount Connor glowed red, signaling it was time to head back to the station roadhouse for dinner and a cold drink before making the drive back to Yulara. Outback 4 wheel drive truck. 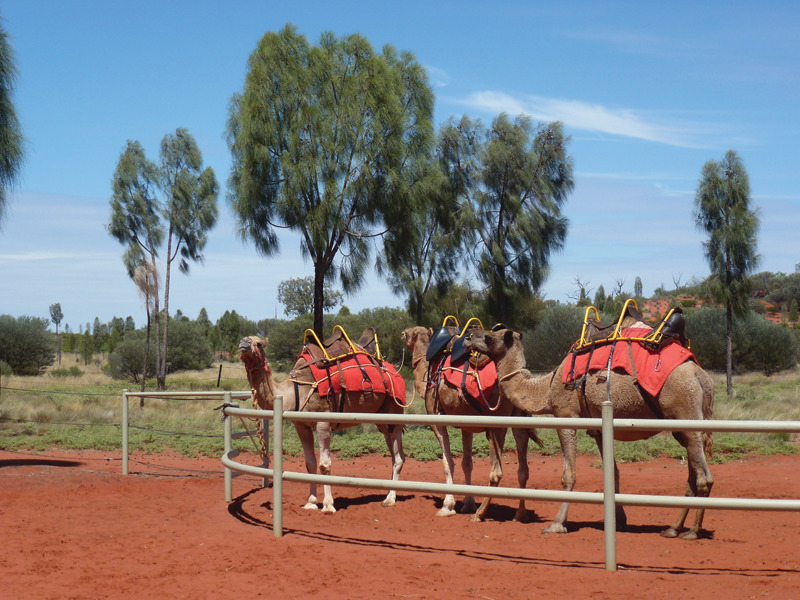 The last part of my trip to the Red Centre was with Adventure Tours Australia on their “Safari in Style” tour. 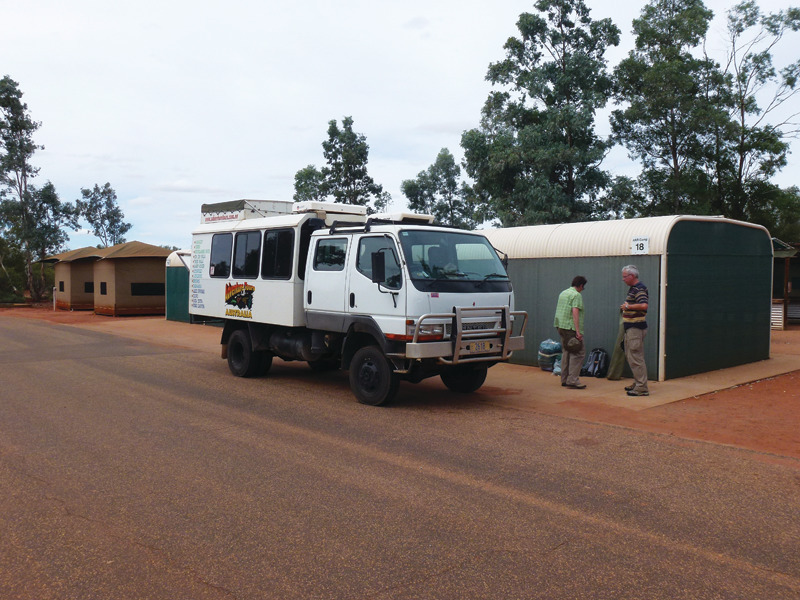 We were a group of eight that traveled together by outback four-wheel-drive and stayed in permanent safari tents along the route to Alice Springs. 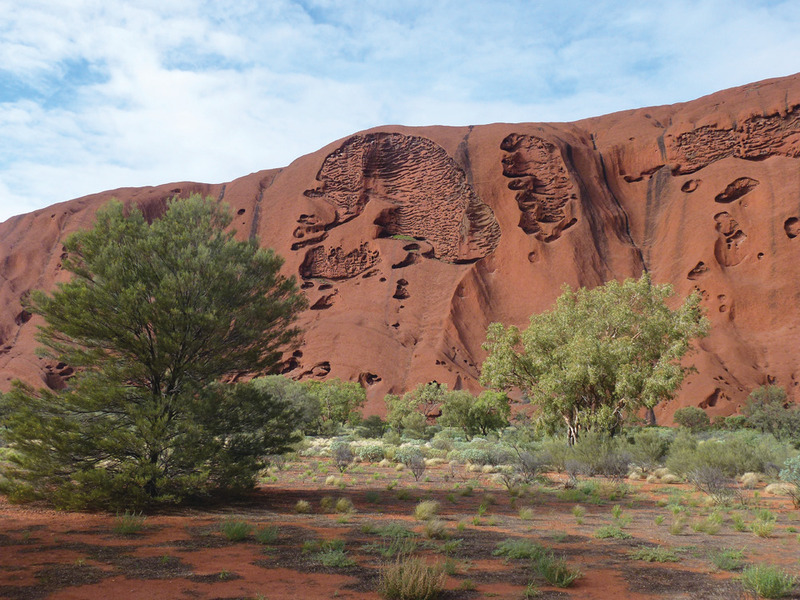 We began with a trip to the Olgas, known locally as Kata Tjuta, and a hike up into The Valley of the Winds. The rock formations, the vegetation and the falcons made for an incredible experience. 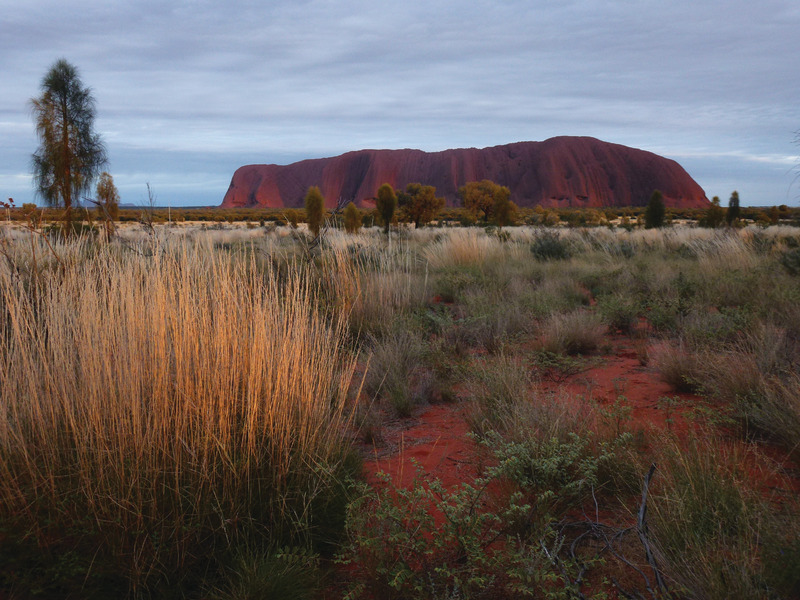 The next day began at 4:45 a.m., early enough to have breakfast before seeing the sunrise at Uluru and making the two-and-a-quarter-hour walk around its base to finish at the cultural centre located there before noon. Many people climb to the top of Uluru instead of taking the walk around it, but I chose the walk, respecting the wishes of the local tribes that discourage climbing on the sacred site. Now having seen Uluru from every angle and in every light, from sunrise to sunset, I can say with authority that it is truly a fascinating sight. Erosion of rock at Uluru. We continued on with a three-hour drive to our next campsite near Kings Canyon, and early the next day made a vigorous hike up through the amazing rock formations that led to its rim. From there it was down into the coolness of the canyon floor with its unexpected foliage and pools, and finally back up the bare, desiccated canyon wall to return to the truck. Bridge at the bottom of Kinds Canyon. All through the various tours, our guides provided commentary on the history, culture and environment of the areas we were seeing. I found this brought good value to this kind of travel. 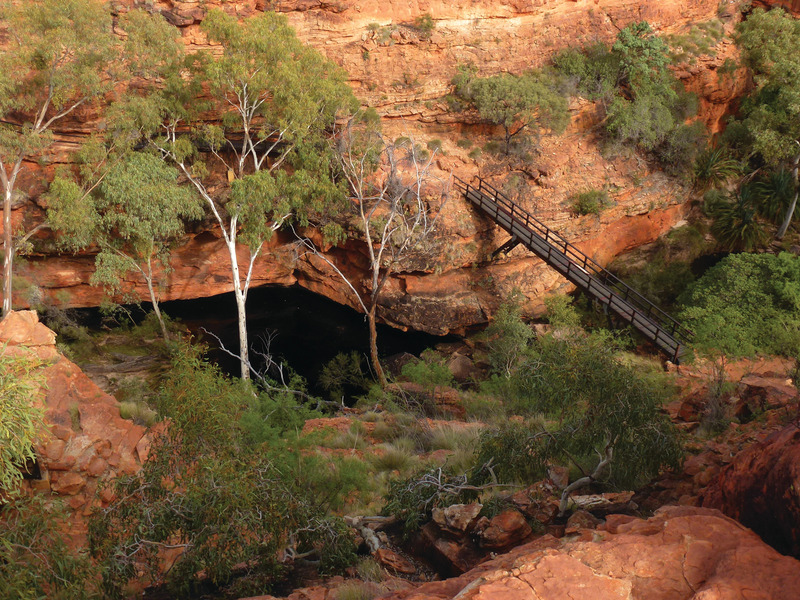 Another value of taking a tour became apparent as we drove the six hours on to Alice Springs. The conversation slowly died down and when I looked around everyone was asleep. You can’t do that on a self-guided tour! 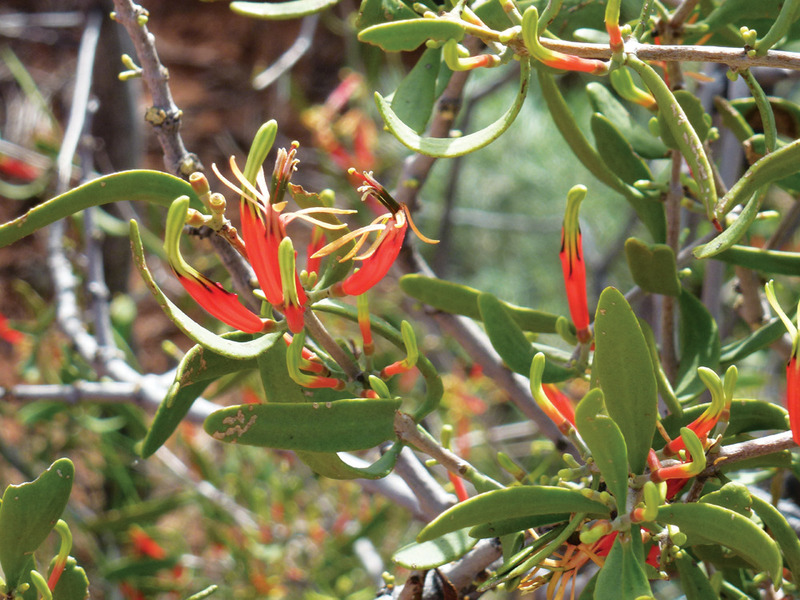 Harlequin Mistletoe in Kings Canyon. It turns out that another party benefited from our tour as well. About halfway to Alice, and hundreds of kilometres from a garage, we picked up a young man whose car had run out of gas. We left the rest of his group with their car and gave him a lift to the next roadhouse where he could get help. 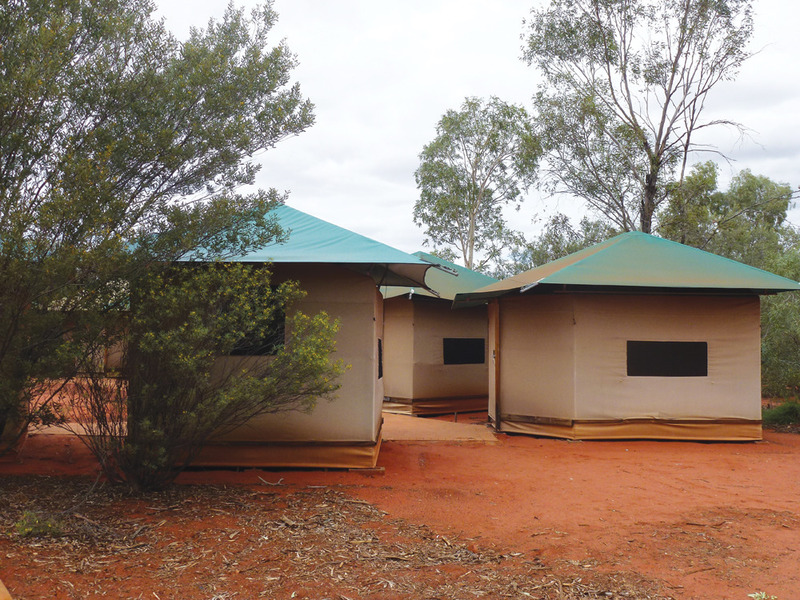 Like in the wilderness areas of Canada, you help those that need it in the Australian outback. All the words that I had heard used to describe the Red Centre are true, depending on your experience and perspective. I would add fascinating, surprising, beautiful and peaceful to that list. I’m glad I made the trip the way I did, and would recommend that anyone interested in this kind of adventure try it for themselves.